I am pleased to meet you at the end of the Plenary Session of the Congregation for the Doctrine of the Faith. I thank the Prefect for his introduction with which he has summarized the most important lines of your work in the last two years. 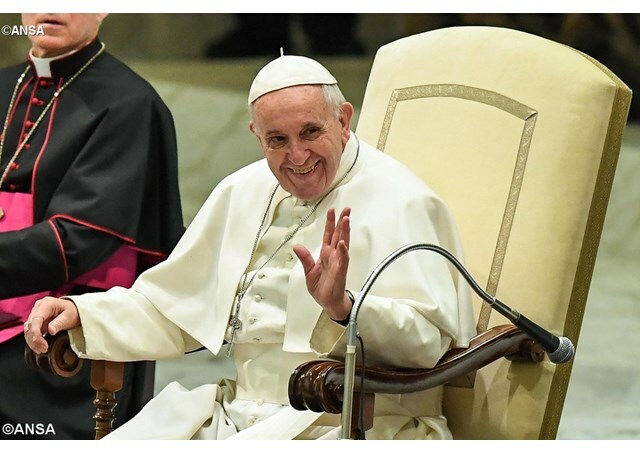 I express my appreciation for your delicate service, which responds to the particular bond of your Dicastery with the ministry of the Successor of Peter, who is called to confirm the brothers in the faith and the Church in unity. I thank you for your daily commitment to support the Magisterium of the Bishops, in the protection of the right faith and the holiness of the Sacraments, in all the various issues that today require important pastoral discernment, as in the examination of cases relating to graviora delicta and applications for dissolution of the marriage bond in favorem fidei. All these tasks are even more current in the face of the horizon, ever more fluid and changeable, which characterizes the self-understanding of the man of today and which has a significant influence on his existential and ethical choices. The man of today no longer knows who he is and, therefore, struggles to recognize how to act well. In this sense, the task of your Congregation in recalling the transcendent vocation of man and the inseparable connection of his reason to truth and good, to which he introduces faith in Jesus Christ, appears decisive. Nothing like the opening of reason to the light that comes from God helps man to know himself and God's plan for the world. I therefore appreciate the study you have undertaken on some aspects of Christian salvation, in order to reaffirm the meaning of redemption, in reference to today's neo-Pelagian and neo-gnostic tendencies. These tendencies are expressions of an individualism that relies on its own forces to save itself. We, on the other hand, believe that salvation consists in communion with the risen Christ who, thanks to the gift of his Spirit, has introduced us into a new order of relations with the Father and among men. Thus we can unite ourselves to the Father as sons in the Son and become one body in Him who is "the firstborn among many brothers" (Rom 8:29). How not to mention, then, the studies that you are carrying out about the ethical implications of an adequate anthropology also in the economic-financial field. Only a vision of man as a person, that is to say, as an essentially relational subject and connoted by a peculiar and broad rationality, is able to act in conformity with the objective order of morality. In this regard, the Magisterium of the Church has always clearly stated that "economic activity must be conducted according to the laws and methods proper to the economy, but in the context of the moral order" (Second Vatican Ecumenical Council) , Cost. Past. Gaudium et Spes, 64). During this Plenary Session, you also studied some sensitive issues regarding the accompaniment of terminally ill patients. In this regard, the process of secularization, by absolutizing the concepts of self-determination and autonomy, has led to the growth of the demand for euthanasia in many countries as an ideological affirmation of man's will to power over life. This has also led to considering the voluntary interruption of human existence as a choice of "civilization". It is clear that where life is valid not for its dignity, but for its efficiency and productivity, all this becomes possible. In this scenario it must be reiterated that human life, from conception to its natural end, has a dignity that makes it intangible. Pain, suffering, the meaning of life and death are realities that contemporary mentality struggles to face with a look full of hope. And yet, without a trustworthy hope that helps him deal with pain and death, man can not live well and maintain a confident perspective in front of his future. This is one of the services that the Church is called to make to contemporary man. In this sense, your mission takes on an eminently pastoral face. Authentic pastors are those who do not abandon man to himself, nor leave him in the grip of his disorientation and his errors, but with truth and mercy they bring him back to find his true face in the good. Authentically pastoral is therefore every action aimed at taking by hand the man, when he has lost the sense of his dignity and his destiny, to lead him with confidence to rediscover the loving fatherhood of God, his good destiny and the ways to build a more human world. This is the great task awaiting your Congregation and every other pastoral institution in the Church. In the certainty of your dedication to this important service, which has always been the main path of the Church, I renew my gratitude and express to you all my closeness, giving you my Apostolic Blessing from my heart.